Now that spring is afoot, I thought it was time for a tale of creepiness. Turn down your lights, shut the drafty windows, and let’s read a bit about Graveyard security and the Resurrection Men. Graves, burials, and dead bodies, were seen entirely different in the 19th century. And to understand this, you have to view it in the light of the emerging health care and medicine studies. First of all, healthcare was less developed. A patient that today would be in a coma, might be declared dead in the 19th century. There was no or little knowledge of resuscitation. Still, people were aware that someone might appear dead but be, in fact, alive. Secondly, the profession of surgeons was developing rapidly. But, in order to learn more about the human body, a dead body was needed to perform anatomies on. But there was no legal way to obtain a dead body. Enter the body snatching. Body snatching is the secret disinterment of bodies from cemetaries. In the 19th century this was done in order to sell the corpses for dissection and anatomy lessons in medical schools, more than grave robbing. Those who practiced body snatching were often called “resurrectionists” or “resurrection-men”. In 1832 the Anatomy Act came to pass, but before that the only legal supply of corpses for anatomical purposes in the UK were those condemned to death and dissection by the courts. Those who were sentenced to dissection by the courts were often guilty of comparatively harsher crimes. The problem was, by the 19th century only about 55 people were being sentenced to capital punishment each year. With the expansion of the medical schools, however, as many as 500 cadavers were needed annually. Body snatching became so prevalent that it was not unusual for relatives and friends of someone who had just died to watch over the body until burial, and then to keep watch over the grave after burial, to stop it being violated. 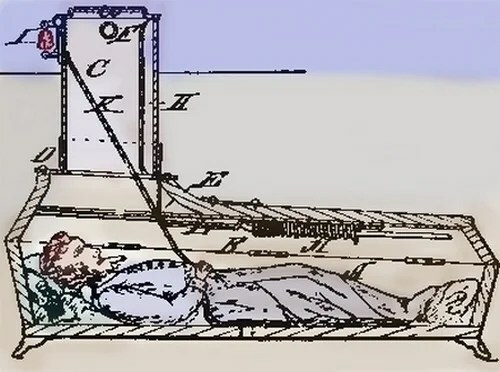 Iron coffins, too, were used frequently, or the graves were protected by a framework of iron bars called mortsafes. In fact, the securing of graveyards heavily impacted the design and layout of graveyards. Some graveyards were secured by walls or railings, some were secured by watchhouses. Sometimes great iron cases were erected over the case, either permanently or for the first few weeks, until the body was safe from body snatchers. “A simple ringing of the bell would do.” Only if someone was there to hear it. I shudder to think of all the people who were buried alive by mistake. I’m sure it happened more often than we’d like to think about. This is fascinating! Thanks for posting.